The flavors of Ireland include many more items than just the stereotypical potatoes (which don’t have much flavor, anyways). 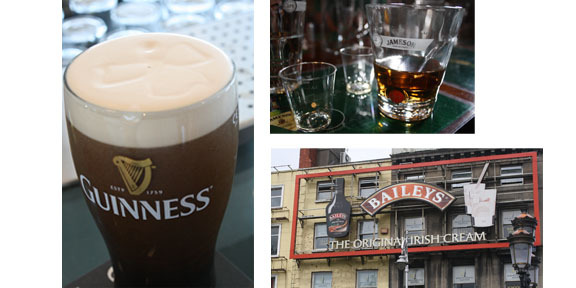 There are fresh cheeses, plenty of meats, and of course, the alcohols: Guinness, Jameson’s and Baileys Irish Cream. Combined, the three are known as an Irish Car Bomb, which many swear tastes like a chocolate milk shake for the time it tastes to chug the drink. Since leaving Ireland, we’ve all been eager to have a reunion for the 21 of us back at JMU. And finally (I say finally, but really, we’ve only been gone 3-and-a-half weeks), Wednesday was the night. During our first or second week in June, we organized a potluck in our dorm rooms at University College Cork. One or two suites brought pasta, another brought bread and salad, and we made chocolate chip cookies. For our reunion, it was the other Katie’s idea to have a Cork-style potluck with baked spaghetti. I said I’d bring dessert. 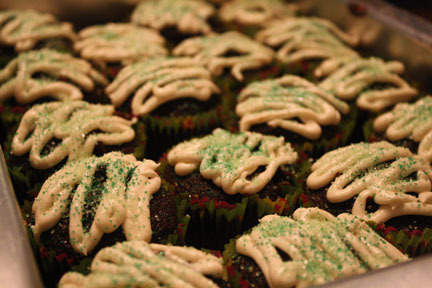 My various cookbooks had recipes for St. Patrick’s Day cupcakes with Baileys icing, but searching online for just a few minutes yielded something even better: Irish car bomb cupcakes, or just Guinness and Baileys cupcakes. Who can resist a rich, chocolate Guinness cupcake, filled with a chocolate and Jameson’s ganache, and topped with a creamy Baileys icing? I know I can’t. 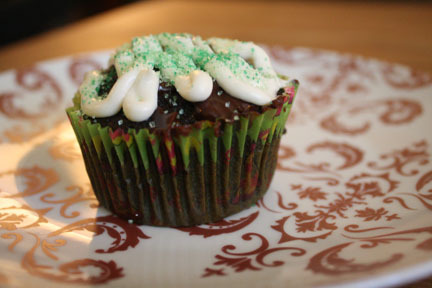 The stout doesn’t make the cake taste like beer, but gives the chocolate a deep, rich flavor.The ganache had just a hint of whiskey and it was an unexpected bite of soft chocolate in the center. 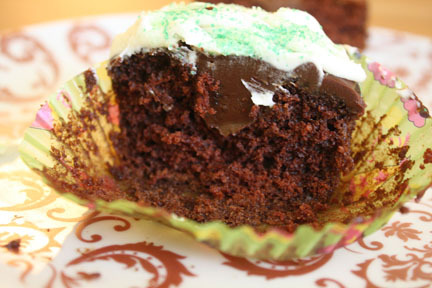 And the sweet Baileys buttercream added just one more flavor to keep the chocolate from being too powerful. I brought the leftovers to the newsroom this morning, and again the cupcakes were met with approval. It’s never too early to start the day with Ireland’s finest flavors, right? From Virginia to California to the Netherlands, I'm chronicling the adventures I share with my husband and our pup. Join us for the ride! Want to read my newest posts? Sign up for email alerts.